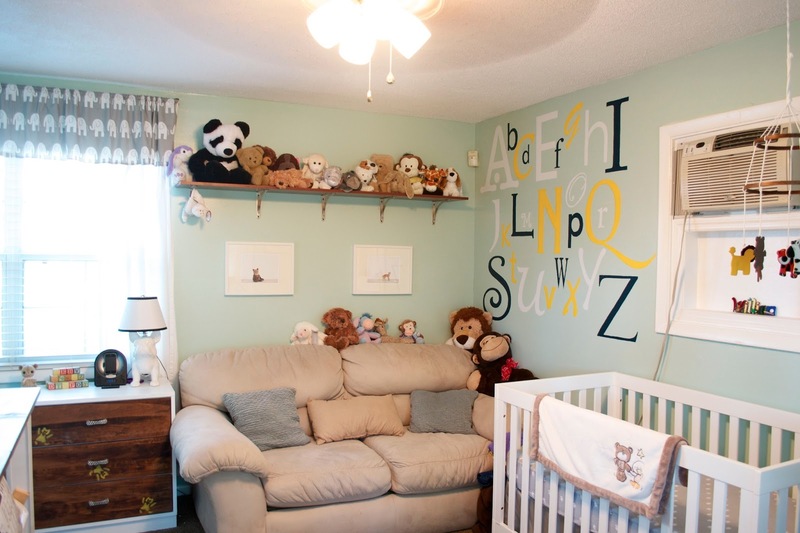 I realized that while I have shown you bits and pieces of the nursery, I haven't given you a full 360˚ view of the room. We start with the view as you walk into the room. 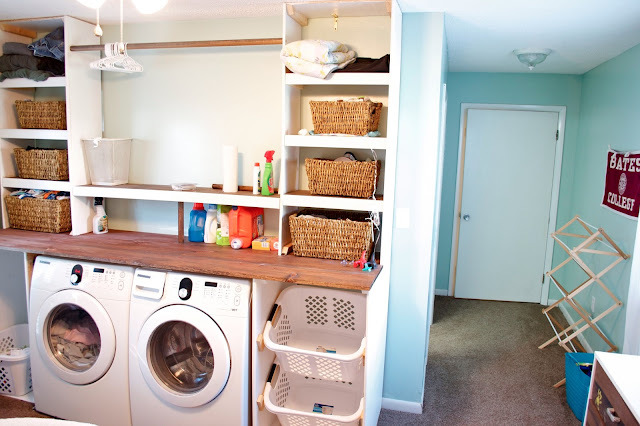 To the immediate right is the laundry unit. If you walk to the other end of the laundry unit near the doors that we made inoperable and turn around, you see the alphabet wall as well as one of the best nursery features, the couch. It's so nice to have a soft place to sit with Will in the middle of the night or to crash on for a few hours. 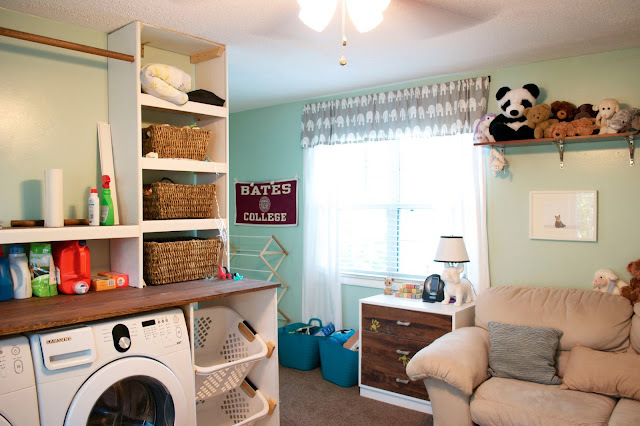 If you look from the corner with the changing table you see the entrance of the room with bear dresser that we redid as well as Will's toy bins that he will be getting into in no time. From the corner with the couch, you see the laundry unit as well as the small hallway that leads to our bathroom and bedroom. Having the laundry in the baby's room has been one of the best things ever. 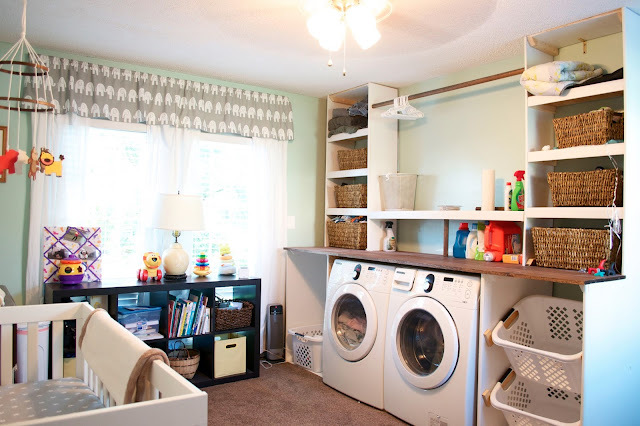 Since we're cloth diapering Will, they have to travel less than 10 feet to the washer and then they can go right on the drying rack and back to the drawer without leaving the room. 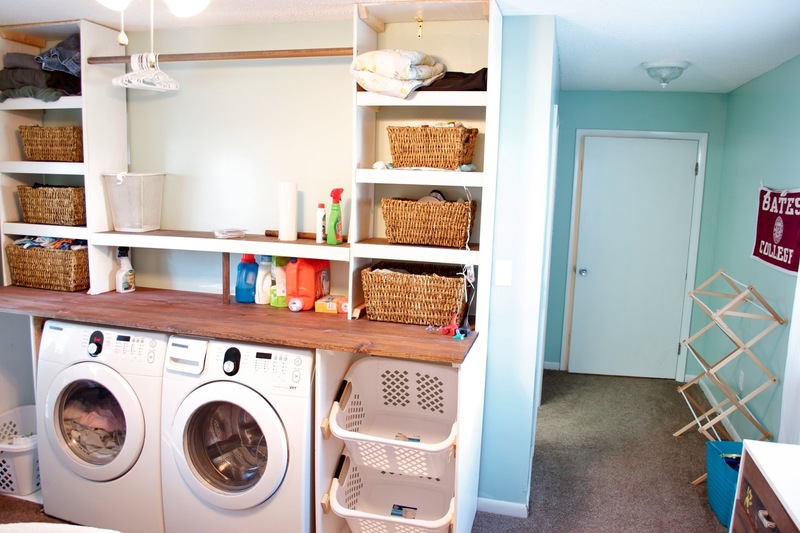 If you turns just a bit more, you get a full view of the laundry unit. We still haven't finished the last little bit of trim/paint but we'll get there someday. Oh and let me introduce you to my shadow. Normally, Madeline is attached to Nate but for this past week she refuses to be less then a couple of feet away from me, preferring to have some part of her body touching mine. It's sweet for the most part, but then there are the times when she tries to sit on me when I'm holding the baby or when she wants to lay right next to my feet while I'm trying to cook in the kitchen. 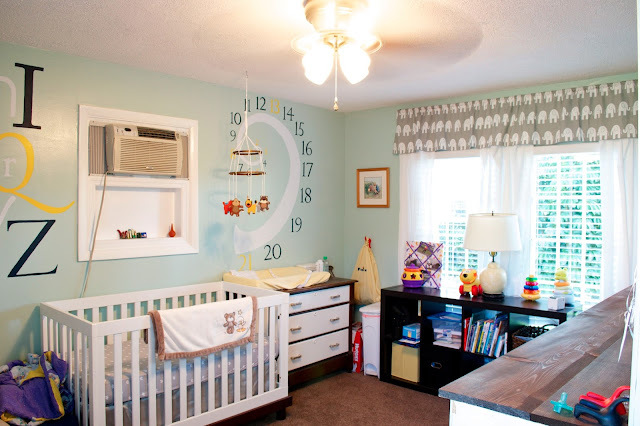 Anyway, back to the nursery, the room is working so well for us. 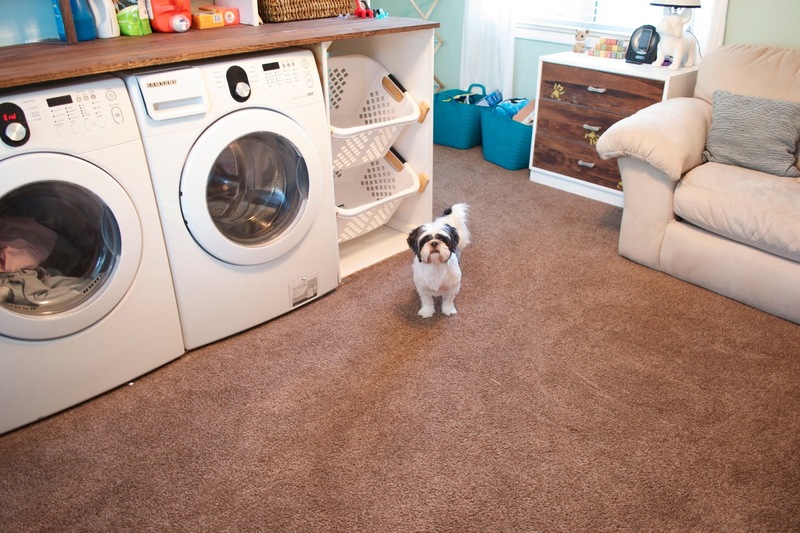 It isn't huge but it is big enough for us to get what we need done and the size actually encourages tidiness since any clutter makes it hard to move around the room. Will is still sleeping in his rocker and not in his crib yet but he does sleep in this room every night. We have a nice setup for us to have successful nights which I'll talk about more next week when I go through some of our favorite things for the first three months with Will. What a lovely nursery! I love the colors and the Alphabet on the wall!! You did a great job creating this space! Thank you! The wall was definitely a labor of love. I love how calming this space is! Thank you. I'll be sure to check it out. How adorable! Thanks for sharing with us this week at Monday Funday!